I have been collecting the Christmas Tube Top Ornaments since at lest 1990. 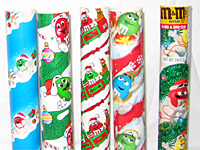 (Grade School at the time) Most of the time I only got the Plain "m" version and only the color I liked or thought was best for that holiday. Since I never put much effort into it, other then picking up a new "m" each year, it seems like I have missed a few here and there. I'm trying to piece together a complete list of the "m"s that where available throughout the years. I need your help ... Some of the newer ones have no © date so I don't know what year I got him or her. I'm also not sure what colors where available those early years, when they put out the same M in every color. 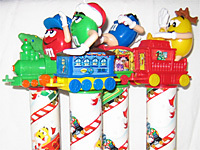 I'm also not sure which tube goes with which ornament, since I eat the candy years ago. These tubes that go with the Christmas Ornaments (1988-2001) I'm not sure which one went with each M, I could use some help we identifing these. 2 cars added each year. This train is "Series 1 ... as printed on the bottom. 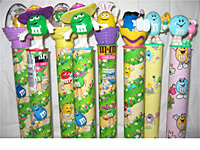 These are the Easter tubes. 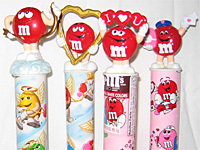 These are the Valentine's Day tubes. In more resent years the Easter and Valentine's have been a soft plush type keychain.